cryptonaut-in-exile: Frontios - "I got this one cheap because the walk's not quite right ... And then there's the accent ..."
Frontios - "I got this one cheap because the walk's not quite right ... And then there's the accent ..."
Ugh. There are parts of this that work, but on the whole is less than the sum of the parts. Or, there are a couple of parts so deleterious they tank the enterprise. Which is a shame, because the arc of the Plantagenet character within the story is sort of rare in the series: we don't often see an unlikable character learn and grow in the course of a story, so when it happens it's novel and redemptive. 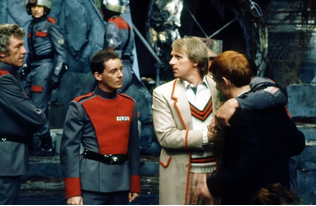 Brazen, Plantagenet, Five, and Turlough after a meteor storm attack. So what kills this one? It's not the stiffness of the Tractator costumes, nor the acting of any of the cast -- which is generally good here, nor the strange (estranged) relation to continuity wherein this story doesn't seem to quite jibe with any version of humanity's future history offered before or after ... these are among the usual the suspects in unsuccessful stories, but not this time. 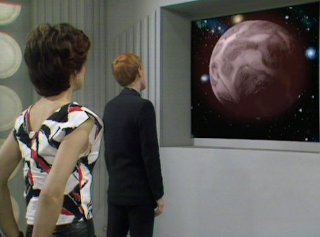 This time, it's the absolutely incomprehensible reaction of not only the Doctor but especially Turlough and Tegan to the apparent destruction of the TARDIS and Turlough's 'race memory' (sorry, parapsychologists, but this is the wrong approach to give a character a motivation an audience of rational beings can buy into) of the Tractators and the way it reduces him to a sniveling, (literally!) slobbering mess. I don't blame Mark Strickson for playing his scenes the way he did, I blame Bidmead for writing it into the story to begin with -- there was no way any actor could've made anything but hash of that mess, so might as well go into full scenery-chewing mode and give'em what they want. drawn to the illicit glimpse of Tegan's bra. Eyes on the screen, sailor! It's tough to grade out a story like this. It was a rewrite away from being a highlight of the season, but instead it's a frustrating failure that I couldn't recommend anyone watch except as a way to learn from easily avoidable mistakes.